The aircraft crashed into a hill near the airport in driving snow after a fourth landing attempt. The aircraft was hijacked by terrorists. Three passengers and four hijackers were killed when the plane was stormed. After a go-around the plane struck a transmission tower and crashed. The chartered flight struck a cliff at 6,400 ft. during a flight from a copper and gold mine. The cargo plane hit trees and crashed short of the runway while attempting to land. The cargo plane lifted off the runway, stalled and hit tail first back on the runway breaking apart. The aircraft crashed 4 miles SW of runway 5L while on an ILS approach. The captain associated the illumination of the left engine ignition light with an engine failure, suspected an engine flame out and decided to execute a missed approach. This eventually led to a stall and the plane crashed 4 miles SW of the runway threshold. The captain's improper assumption that an engine had failed. The captain's subsequent failure to follow approved procedures for engine failure, single-engine approach, go-around, and stall recovery. Contributing to the cause of the accident was the failure of American Eagle management to identify, document, monitor and remedy deficiencies in pilot performance and training. Crashed en route on a dark snowy night. VFR flight by the pilot into instrument meteorological conditions (imc), and his failure to maintain sufficient altitude or clearance from mountainous terrain. An explosive device detonated at FL 300 under a seat in the passenger cabin blowing a two square foot hole in the cabin floor and killing one passenger in seat 26K. The bomb was placed on the plane by Ramzi Yousef, an Al-Qaeda terrorist, on the flight from Manila to Cebu. The explosion occurred on the second journey of the flight from Cebu to Tokyo. The plane made a safe emergency landing at Okinawa in spite of damage to the flight controls. Shot down by UNITA rebel forces. Crashed into a mountain in poor weather conditions. During its takeoff roll, the DC-9 collided with the Cessna, which was waiting for clearance to take off. The ground collision took place in the fog. The Cessna pilot mistakenly thought he had clearance to enter the runway. Two aboard the Cessna were killed, none were killed aboard the DC-9. While en route, the cargo plane made an uncontrolled descent and crashed. Loss of aircraft control at night by the pilot for unknown reasons. The pilot delayed landing to avoid a pedestrian on the runway, overran the runway and crashed into Saposoa River breaking up. The cargo plane crashed into a mountain a 4,000 ft. Crashed into the sea off of Cozumel while en route in poor weather condtions. Fuel exhaustion. The aircraft was in a holding pattern and was descending to a newly assigned altitude of 8,000 feet when it experienced an uncommanded roll and excursion and crashed during a rapid descent. Icing. The design of the rubber de-icing boot was insufficient to deal with icing on the wings. Sudden and unexpected aileron hinge movement reversal, that occurred after a ridge of ice accreted beyond the deice boots while the airplane was in a holding pattern during which it intermittently encountered supercooled cloud and drizzle/rain drops, the size and water content of which exceeded those described in the icing certificication envelope. The airplane was susceptible to this loss of control and the crew was unable to recover. Contributing factor was the French Directorate General for Civil Aviation's inadequate oversight of the ATR42 and ATR 72, and its failure to take the necessary corrective action to ensure continued airworthiness in icing conditions and failure to provide the FAA with timely airworthiness information developed from previous ATR incidents and accidents in icing conditions. The cargo plane suddenly pitched down and collided with a hill. Icing. Pitched up and crashed on takeoff. Overweight and improperly loaded. Shot down by rebel forces. Exploded in mid air while en route, 60 km northeast of Brasilia. A load of munitions being carried on the aircraft exploded. Thirty-five minutes after taking off from Isfahan, the aircraft made an uncontrolled descent after losing power in both engines and crashed into a mountain. The plane landed short of the runway bounced, collapsed the landing gear, veered off the runway and crashed into another plane and vehicles. Crashed at sea 42 minutes after departing. The pilot reported mechanical problems before contact was lost with the plane. The cargo plane failed to gain altitude, overran the runway and crashed. Crew error. Crashed after experiencing engine failure. After three landing attempts at Tura, the crew diverted to Vanavarva because of bad weather. The aircraft ran out of fuel and crashed on a river bank about 40 km from Vanavera. The cargo plane lost control shortly after becoming airborne, began losing altitude and ditched 500 meters from the runway. The No. 4 prop pitch control system failed. After circling for almost an hour and a half and aborting four landing attempts in adverse weather conditions, the aircraft ran out of fuel and crashed. Just as the plane took off there was a pitch-up and stall resulting in the plane crashing into the water. The down elevator control cable failed at station 367 due to corrosion. The failure resulted from salt water induced corrosion. The aircraft had recently undergone a periodic inspection but the damage had apparently not been discovered. The aircraft few into the side of a hill during heavy rain, high winds and severe turbulence. While on approach, the aircraft went into a sudden nose dive from 6,000 ft. and crashed into a wooded ravine 6 miles northwest of Pittsburgh International Airport. The accident was caused by a loss of control of the aircraft resulting from the movement of the rudder surface to its blowdown limit or an uncommanded rudder reversal. The rudder surface deflected in a direction opposite to that commanded by the pilots as a result of a jam of the main rudder PCU servo valve secondary slide to the servo valve housing offset from its neutral position and overtravel of the primary slide. The most likely sequence of events that led up to the accident included the jamming of the PCU servo valve, the application of light left rudder followed by hard right rudder which caused the rudder to reverse in the opposite direction the pilot commanded it to go. The application of hard right rudder was possibly initiated because the plane flew into the wake vortex of a B-727 which rolled the plane to the left. Rudder hardover is normally corrected with the stick (ailerons) but because the plane was flying at the crossover speed of 190 knots with flaps 1, using the stick would not correct the situation. When the right rudder was applied the rudder went to its fullblown left position causing the plane to roll further left, stall and go into a dive. Some speculate if the pilot-in-command pushed forward on the yoke to gain some speed rather than pull back, the accident possibly could have been avoided. Blame was not placed on the crew because there was no mention of this type of recovery by the manufacturer nor was there any training for such an occurrence. The aircraft entered a steep dive from 16,000 ft. and crashed 10 minutes after taking off from Agadir. The pilot was blamed for disconnecting the autopilot and deliberately causing the crash and committing suicide. This was challenged by the Moroccan Pilot's Union. Suffered engine failure and made a crash landing on terrain near the shoreline of a body of water. Fatigue cracking of the engine case, which resulted in eventual damage to the #3 cylinder studs/engine through-bolts, subsequent separation of the #3 cylinder and piston, and an in-flight fire. Inadequate maintenance and inspection. The non-instrument rated commercial pilot was en route at 2000 feet msl on a night VFR flight when he reported an inadvertent encounter with instrument meteorological conditions. The helicopter (N124NH) subsequently crashed in a wooded area while in a steep descent. Continued VFR flight into IMC. The pilot flew into a blind box canyon and crashed while attempting to turn around. Improper in-flight planning /decision by the pilot and his failure to remain clear of mountainous terrain. The box canyon and proximity of mountains were related factors. The aircraft overran the runway and caught fire while landing during adverse weather conditions. The approach was flown with slats/flaps at 15/20 degrees due to suspected windshear. Crew error. There was a struggle and argument between the captain and co-pilot during the last seconds of the landing as to whether they should go-around. Continued VFR flight into IMC. Crashed and burned while attempting to land with an engine fire in poor visibility and heavy rain. Crashed 5 minutes after taking off from Kilo Lima. Crashed on a wooded hillside shortly after taking off from Colon after a bomb exploded aboard. Crashed into high ground while on approach to land. Ran off the end of the runway and crashed. The crew used the normal and emergency brake systems at the same time which resulted in the aircraft having no brakes at all. The aircraft lifted off slowly. After lift-off, the plane settled in a descenting left turn and crashed. Excess gross weight and incorrect CG caused the plane to stall. The aircraft crashed into trees and a private residence after a missed approach during adverse weather conditions. Microburst induced windshear. Crew's inability to recognize windshear and microburst conditions. The flightcrew's decision to continue an approach into severe convective activity that was conducive to a microburst. The flightcrew's failure to recognize a windshear situation in a timely manner. The flightcrew's failure to establish and maintain the proper airplane attitude and thrust setting necessary to escape the windshear. The lack of real-time adverse weather and windshear hazard information dissemination from air traffic control. The plane crash landed on the runway in adverse weather, after a second landing attempt, breaking the landing gear and sliding off the side of the runway. The plane crashed after demonstrating a simulated engine failure on takeoff. Caused by a number of factors relating to the test and actions of the crew none of which singley would have caused the crash. Unexpected mode transition to altitude acquire mode during a simulated engine failure resulted in excessive pitch, loss of airspeed, and loss of control. Pitch attitude protection not provided in altitude acquire mode. Shot down by Afghan troops. Crashed on approach 3 miles short of the runway into a wooded area. The float plane hit the surface of glassy water and crashed. VFR flight into IMC. Failure to maintain altitude above the river. The aircraft crashed in poor weather conditions 0.8 nm south of the threshold of runway 1R at Dulles International Airport while attempting a ILS landing. Poor airmanship and relative inexperience of the captain in initiating and continuing an unstabilized instrument approach that led to a descent below the authorized altitude without visual contact with the runway environment. Contributing to the cause of the accident was the lack of a GPWS on the airplane. The aircraft struck Mt. Kalora at 2,300 feet while on a visual approach to Palu. The accident happened in generally good weather but with reduced visibility in clouds and haze at the mountain. The aircraft flew into high ground during a go-around. The accident happened in darkness and in poor weather with rain and heavy clouds. The accident was attributed to the pilot's failure to follow the established go-around procedure correctly. The plane broke-up in flight 10 minutes after taking off. Auto-pilot induced oscillations caused the aircraft to shake violently. The autopilot yaw-channel was accidentally connected to the bank control and the bank-channel to the yaw controls. The helicopter crashed into The Mountain of the Stone Slab at an elevation of 800 ft. Pilot error in proceeding towards high ground in heavy fog below a safe altitude. Crashed shortly after taking off after double engine failure. Crashed while making an emergency landing following engine trouble. The aircraft was destroyed when it undershot the runway during a visual approach to Sao Gabriel and stuck trees. Crashed into a mountain while inbound for Bogota. While on ILS approach to Nagoya Airport, at an altitude of 1,000 feet, the first officer inadvertently triggered the TOGA (take-off-go-around) lever. The crew tried to override this situation by turning off the autothrottle and reducing air speed. The aircraft stalled, hit the runway tail first and burst into flames. The plane crashed because of an extreme out of trim configuration brought about by the fact that the tailplane setting had moved automatically and undetected to a maximum nose-up position. The plane climbed at a steep angle until it stalled. The crew could have saved the aircraft even in the final seconds had they reverted to basic flight procedures and switched off the autopilot. Crashed into Mt. Saran 30 minutes before it was scheduled to land in poor weather condtions. Shot down by friendly fire during the Gulf War. Thirteen killed on each helicopter. Shot down by a missile. President of Burundi, Cyprien Ntaryamira and president of Rwanda, Juvenal Habyarimana were killed. Struck Mt. Lozan, at 13,400 ft. which was obscured by clouds 47 minutes after taking off. Shortly after taking off, the plane experienced engine problems and returned to the airport. While attempting to land the aircraft rolled to the right, pitched up, stalled and crashed. Inadequate use of the flight controls during an asymmetric go-around resulting in loss of control. Contributing factors were insufficient understanding of the flightcrew of the SAAB 340B engine oil system, lack of awareness of the consequences of an aircraft configuration with one engine in flight idle and poor crew resource management. The helicopter crashed shortly after takeoff. The ingestion of foreign material (snow) in the engine, which resulted in a flameout (loss of engine power). Factors related to the accident were: the adverse weather conditions (snow falling & high density altitude), the lack of snow covers to protect the engine intakes while parked and awaiting for the weather conditions to improve, improper planning/decision by the pilot and the company/operator management, inadequate information in the flight manual, and the lack of suitable terrain for an emergency landing. The jet fighter collided in mid air with the transport as they approached Pope Air Force Base. The fighter then slid into a staging area where troops were boarding a third aircraft (66-0173). The two fighter jet pilots parachuted to safety and the crew of five of 68-10942 were not injured but 23 on the ground were killed. Confusing instructions given to the F-16 by a civilian tower controller at Fayetteville. The plane crashed during an approach to Bogota. The aircraft crashed after a captain allowed his child to manipulate the controls of the plane. The pilot's 11 year old daughter and 16 year old son were taking turns in the pilot's seat. While the boy was flying, he inadvertently disengaged the autopilot linkage to the ailerons and put the airliner in a bank of 90 degrees which caused the nose to drop sharply. The co-pilot pulled back on the yoke to obtain level flight but the plane stalled. With his seat pulled all the way back, the co-pilot in the right hand seat could not properly control the aircraft. After several stalls and rapid pull-ups the plane went into a spiral descent. In the end the co-pilot initiated a 4.8g pull-up and nearly regained a stable flight path but the aircraft struck the ground in an almost level attitude killing all aboard. The aircraft was named Glinka, after Mikhail Glinka, the father of Russian music. Lost an engine while taking off and then lost a second engine and crashed 1,300 ft. beyond the runway. After discharging passengers the sea plane took off, the nose pitched up and crashed. Failure of the pilot-in-command to assure the bilges were adequately pumped free of water, which resulted in the aft center of gravity limit to be exceeded, and failure of the aircrew to follow the checklist. A factor related to the accident was the water leak. The cargo plane lost a right engine during takeoff. The plane tried to return to the airport but crashed. The failure of the pilot-in-command to maintain airspeed. Factors to the accident were: cylinder fatigue, dark night and stall encountered. Shot down with a missile by Armenian forces while en route. Crashed into sea after a shell exploded in one of the gun barrells. Crashed while attempting to land at Tamworth. Crashed during touch-and-go exercises. Application of wrong rudder by trainee pilot during engine failure exercise. Captain did not guard/block the rudder control and give clear commands as instructor so as to obviate the application of wrong rudder control by the trainee pilot. The aircraft overran the runway and came to rest at the edge of the east river, after an aborted takeoff. Failure to turn on the pilot/static heat system resulting in erroneous air speed indication. Though heavily damaged, the plane was repaired and put back into service. The plane struck Cerro Carpich at 4,000 ft., 6 minutes after leaving the airport at Tingo Maria. The cargo plane struck trees and high terrain after losing three engines during severe icing. Multiple engine failures occurred as a result of flight in extreme icing conditions. Incomplete performance of the emergency drills by the crew, as a result of not referring to the Emergency Checklist, prejudiced the chances of successful engine re-starts. Crew actions for securing and re-starting the failed engines, which were not in accordance with the operator's procedures, limited the power available. 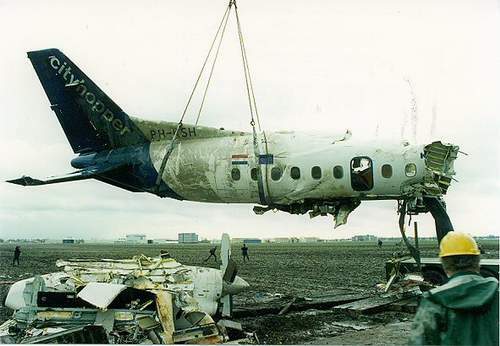 The drag from two unfeathered propellers of the failed engines and the weight of the heavily iced airframe resulted in a loss of height and control before the chosen diversion airfield could be reached. Poor Crew Resource Management reduced the potential for emergency planning, decision making and workload sharing. Consequently, the crew had no contingency plan for the avoidance of the forecast severe icing conditions, and also was unaware of the relative position of a closer diversion airfield which could have been chosen by making more effective use of air traffic services. While on approach the nose pitched up, the aircraft stalled and crashed short of the runway. Icing of the horizontal stabilizer. The cargo plane ran out of fuel and crashed. The aircraft stalled 1.2 miles east of runway 28L during an ILS approach. An aerodynamic stall occurred when the flightcrew allowed the airspeed to decay to stall speed following a poorly planned and executed approach characterized by an absence of procedural discipline. Improper pilot response to the stall warning including failure to advance the power levers to maximum and inappropriately raising the flaps. Flightcrew's inexperience in a "glass cockpit" automated aircraft. The pilot indicated he had engine trouble and was attempting to land at Okeechobee. When he could not find the airport, he attempted to land on a dirt road. Upon observing a car on the road he aborted the landing rolled to the right and crashed into trees. Improper remedial action concerning a right engine power anomaly and the failure to maintain adequate airspeed during a go-around from a precautionary landing. Failure of the right engine fuel control bearing. The plane crashed during takeoff following a fire in the No. 2 engine and subsequent loss of the two remaining engines. Faulty air starter unit. Crew took off ignoring the "starter warning light" thinking it was false. The crew underestimated the severity of the situation due to shortcomings in the operational documentation. Breakup of the No.2 engine starter, damaging fuel and oil lines and causing a fire.